A Duneloader in GTA V.. 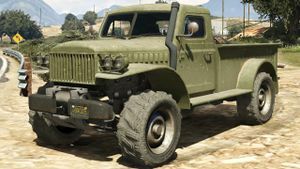 The Bravado Duneloader is a pick-up truck in Grand Theft Auto V based on the 1940s Dodge Power Wagon. This page was last modified on 22 December 2013, at 21:21.